I have been working with ion microprobes for over three decades now, and I have witnessed major technological advances over that period. For example, the isotope ratio repeatability for major elements that are now possible for a modern secondary ion mass spectrometer (SIMS) is down to ± 0.1‰ on a fairly routine basis, perhaps a factor of five better than was the case just two decades ago. However, one aspect that has seen little improvement for most SIMS machines is the challenge of sample viewing. The fundamental problem is one of simple geometry for the large-radius instruments that are used for both isotope ratio and geochronology applications: secondary ions must be extracted perpendicular from the sample surface, meaning that the objective for the sample viewing microscope cannot be positioned where it really needs to be. Two possible solutions exist that enable real-time viewing: the first is by employing a Schwarzschild lens with a central hole in each of its mirrors; the second is to use oblique viewing. Neither of these solutions are really satisfactory because spatial resolution remains limited to no better than 2–3 µm. This leaves plenty of opportunity for the SIMS analyst to position his/her analysis on small cracks, scratches, or micron-sized inclusions which remain invisible to even the best trained eye. Back in the late 1980s while doing my PhD research using the original sensitive high-resolution ion microprobe (SHRIMP) instrument in Canberra (Australia), the U–Pb dating of zircons meant photographing each crystal and then bicycling downtown to a camera shop carrying rolls of 35 mm film that took around three days to develop and print. With this strategy, having amassed perhaps 75 detailed reflected-light images and a low magnification map made from photos pasted to a poster board, one was ready to run. Nowadays, things have changed somewhat. We now have digital reflected-light mosaics of the entire 1-inch [2.54 cm] sample mount that can be calibrated to a SIMS sample stage position to within a few microns. We commonly augment this sample documentation with backscattered electron images and panchromatic (i.e. black and white) cathodoluminescence (CL) images made of key locations using a field-emission scanning electron microscope (SEM) housed in a neighboring section of my institute. Such images provide crucial information for targeting the best domains for isotope ratio or U–Pb analyses, and such images can be extremely helpful in understanding subsequent data sets that turn out to be more complex than anticipated. However, this routine use of SEM documentation is not without its problems. Waiting times for accessing such high-end analytical equipment can run into many weeks, if not months. And, if due care is not taken, the extremely high current densities that a field emission source delivers can damage the epoxy resin. Image mosaics of the entire surface of a 1-inch SIMS mount are time consuming. Samples need to be coated with a conductive film in order to achieve the imaging performance of a field-emission SEM. Finally, it just seems like a misuse of analytical resources to use a machine that delivers 2 nm imaging resolution when 200 nm spatial resolution would more than suffice for my needs. Figure 1. 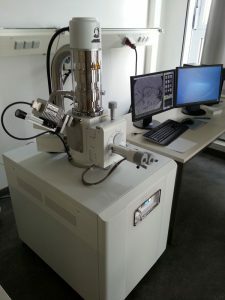 The small format scanning electron microscope (SEM) at the Hochschule für Technik und Wirtschaft (University for Applied Sciences), Berlin (Germany). I have long been on the lookout for an alternative sample documentation strategy. This is the background as to why I contacted the company JEOL Germany to inquire about the JSM-IT200, the newest in their line of compact SEM instruments. The information that I received convinced me that this technology was worth a more detailed look. Such compact scanning electron microscopes have been around for more than two decades, and, during this period, the performance capabilities have advanced greatly. My first stop was a visit across town to Berlin’s University of Applied Sciences (Hochschule für Technik und Wirtschaft) where Klaus Heinrich showed me his two-year-old JSM-IT100 system (Fig. 1). His laboratory is a very practical one where student users with little to no microanalytical experience can quickly understand the basics of the instrumentation in order to generate images for their research projects. I believe that Klaus’ enthusiasm for his SEM is well justified, both in terms of instrument design and the highly intuitive software layout. Just imagine a system where clicking on the button labeled “Focus” results in the image on the computer screen instantly sharpening. Clicking on the button labeled “Magnification” produces a drop-down menu where the present magnification is clearly shown and all the other options are obvious. These and the other software features really seem designed with the machine–human interface at the forefront. Another feature that impressed me was that the JSM-IT100 site requirements consisted of (1) an electric socket, and (2) an RJ45 internet socket. That’s all there was. And the internet socket itself was actually extraneous if one doesn’t wish to run the instrument remotely. Small footprint. Simple to learn. Simple to operate. Truly impressive. The needs of the Potsdam SIMS laboratory that I manage derive from large-area backscattered electron mosaic images that cover an entire 1-inch sample mount, to secondary electron images with <100 nm spatial resolution, to color CL imaging. For further help, I turned to JEOL and requested that a demonstration session be arranged on a suitably configured instrument. Two weeks later, I took the 230 km drive to the University of Jena where Sven Schönherr at the Institute for Solid State Physics had agreed to show me his JEOL system, which was based on an eight-year-old JEOL compact system augmented with a high-end Gatan spectrometer for acquiring both CL spectra and for narrow waveband image acquisition. Such a system should be able to provide a 50 nm spatial resolution, so one test that I requested was that a fine-structured sample should be imaged. I had brought with me a vial of diatoms which I had obtained from Hanno Meyer, a colleague of mine at the Alfred Wegner Institute in Potsdam. 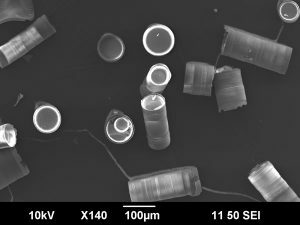 These 100 µm structures were sprinkled onto a sticky carbon film prior to being carbon coated. The images, acquired in a matter of minutes (Fig. 2), lived up to expectations. The spatial resolution was well below 100 nm, and this was achieved with little effort in terms of tuning and optimization. Nicer still, I was assured that fairly similar results could be achieved using low vacuum mode and without sample coating. My key motivation for travelling to Jena was to get an impression of the color CL capabilities of a compact SEM. What is important to understand here is that CL photon spectrometers are always mounted on a port on the side of the SEM’s sample chamber, and this means that a mirror with a central hole must be placed into the electron beamline; all CL images are acquired in a scanning imaging mode. For the Jena machine, the mirror was placed near the surface of the sample, which is advantageous for their spectroscopic applications but means that CL and backscatter modes cannot be operated concurrently (though other system geometries don’t suffer this limitation). Another constraint of the arrangement in Jena was that the presence of the mirror in the electron beamline leads to shadow artifacts when scanning more than ~100 µm off axis. This would be a major problem with regards to my needs in the Potsdam SIMS lab, but I have been assured that other CL detector geometries suffer much less from this issue. That said, for spectroscopic applications, the Jena system yielded high-quality results. An example that I present here (Fig. 3) shows the spectra from two zircon samples that include Temora2 (blue filled area) (Black et al. 2003) and a second material currently being investigated in Potsdam (red line). Clearly, there is a lot of valuable information in such data sets. Equally clear is that there are decisions that need to be made when configuring a system so that it is optimized to one’s specific analytical needs. I was still keen to get an impression of the color CL imaging capability of the Jena instrument. 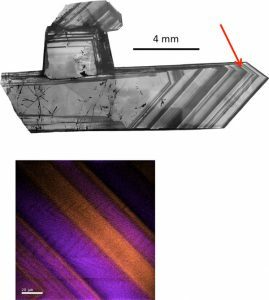 For this, we used a large quartz crystal provided by Axel Müller (University of Oslo), which he had previously been imaged in panchromatic CL (Fig. 4A) (Müller et al. 2018). The largest area that we could scan without excessive shadowing from the in-line mirror was 125 × 125 µm, and we conducted such a scanning image for two wavelengths centered on 411 nm and 640 nm using a 4 nm spectrometer slit. Each such scan took but a few minutes to complete, after which software constructed an integrated false-color image from these two monochromatic images (Fig. 4B); see Götze and Möckel (2012) for an overview of trace elements and CL emission in quartz. There is a wealth of information evident in such images. However, the Jena system, which is optimized for spectroscopy, was not well suited for color CL imaging over large areas. That said, a simpler CL detector system that is configured more toward imaging would fit the task better. Considering all of the points discussed above, it should be clear that the JEOL line of compact SEMs does impress me. And there is one more important thing that I have yet to mention. The purchase price of such a compact system is perhaps 80% below that of a top-end field-emission SEM! 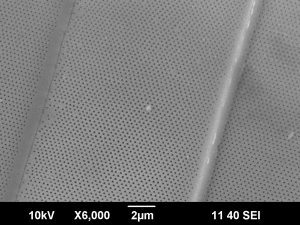 For researchers wanting to invest in scanning electron technology there is now a fundamental question: Do you really need nanometer-scale resolution? If not, then the JSM-IT200 from JEOL, or a similar product from another company, such as Hitachi, Phenom or Zeiss, might be a better choice. I would like to finish this discussion by thanking everyone who contributed towards my understanding of the true capabilities of compact SEM instrumentation. Alex Müller of the University of Oslo provided the quartz sample for CL imaging, and Hanno Meyer of the Alfred Wegner Institute in Potsdam provided the diatom sample for testing imaging performance. I would also like to express my particular thanks Klaus Heinrich at Berlin’s Hochschule für Technik und Wirtschaft for giving me a tour of his JEOL lab and to Sven Schönherr of the University of Jena for a very interesting day devoted to a detailed demonstration of his SEM, including his patience in producing the wide variety of test images I proposed. Finally, Leon Hütsch from JEOL Deutschland GmbH is gratefully acknowledged for having arranged these contacts for me and for his tireless willingness to answer my many questions.